EcoIsland is a major UK initiative under which the Isle of Wight plans to become a net energy exporter by 2020, utilising a smart grid infrastructure developed with global technology partners. EcoIsland aims to make the Isle of Wight carbon-neutral and energy self-sufficient by 2020, through technological innovation and by promoting and providing incentives for social change. The EcoIsland concept is the brainchild of a charismatic local man, David Green, who has worked with a wide range of local people and international companies to bring it to fruition. Like many islands, the Isle of Wight (IOW) is particularly vulnerable in terms of meeting its energy, fuel, food, water, and waste disposal needs, and in particular it wants to improve its energy security. The Island benefits from some of the best natural resources in the UK, with great solar, wind and tidal power potential, as well as promising geothermal resources just 2 km below the surface. There are already quite a few solar PV installations on the Island, to the point that at some times (e.g. Sunday mornings) the IOW is actually a net exporter of energy. Plans are in hand for a £25 million (US$40 million) project to install rooftop solar panels on much of the social housing across the Island, with small and medium-scale wind turbines also being encouraged for the wider community and small businesses. The IOW Council is also looking at utilising energy-from-waste technologies, given the very limited space available for landfill disposal. EcoIsland is also investigating possible tidal power installations at Hurst Narrows in the west and/or St Catherine’s Point at the southern tip. David Green is co-founder and CEO of the EcoIsland Community Interest Company (CIC), which was launched in 2011 to provide a formal entity with the broad goal of improving the resilience of, and promoting and achieving sustainability in the Isle of Wight. The CIC is a newly constituted regulatory framework in the UK that is specially designed to accommodate social enterprise initiatives. The CIC is allowed to buy, sell, borrow, lend, own assets, and employ without the typical constraints of a charity. The key principle is that all of its assets are locked into the community it serves. The EcoIsland CIC is also backed by the financial and technical resources of global partners Toshiba, IBM, Cable&Wireless Worldwide, and Silver Spring Networks, and national partners Toyota, SSE, ITM Power, Gloucester Composites, and Southern Water, as well as some 60 other partners and organisations. Within the EcoIsland CIC sits the EcoIsland Energy Service Company (EESCo), which will also act as an energy aggregator to enable the trading of generation and demand assets for the Island on the UK’s energy markets. A smart grid infrastructure will be deployed to support the special projects, allowing the EESCo to integrate both generation assets and demand-side resources from the Island’s small and medium enterprises (SMEs) and domestic consumers. This smart grid balancing system, with significant demand-side management capabilities, will enable loads to be curtailed where advantageous market conditions prevail. The minimal latency of the system will enable the aggregated system output to be traded on the balancing mechanism and provide fast demand response for the National Grid. Energy storage is the ‘holy grail’ of the aspirant smart grid, and the EcoIsland partners are involved with a number of trials of battery and hydrogen storage to supplement the energy system. This extra layer of fast response enhances the flexibility of the aggregated load available for trading. By managing the smart infrastructure and ensuring the stability of the grid, the EESCo will reduce the need for expensive network reinforcement. The Isle of Wight network is already one of the most advanced, self-healing networks in the UK at the 11 kV level, which is optimal for smart grid operations. The system will be monitored and managed centrally, and will be optimised to ensure benefits for Island residents while maximising the tradable value of the energy generated and stored. Much of the generation will be committed to power purchase agreements, and benefit from subsidies such as Feed-In Tariffs (FITs), Renewable Obligation Certificates (ROCs), and Renewable Heat Incentives (RHI). A proportion of the energy output being held outside of this mechanism to enable trades on the Short Term Operating Reserve (STOR) and bilateral markets. At the heart of the EcoIsland project is a smart grid infrastructure developed in collaboration with global partners Cable&Wireless Worldwide, Silver Spring Networks, Toshiba, and IBM. Cable&Wireless and Silver Spring Networks are providing technology for the IPv6 communications platform, that is a combination C&WW network and radiofrequency wireless mesh that connects houses, SMEs, and the component parts of the Virtual Power Plant (VPP) resources. The communications platform provides two-way control, and data can be sent back to the central hub for processing. The platform is resilient, self-healing, and capable of remote upgrades to ensure that it is future-proof. The asset and telemetry data are routed to the EcoHUB data centre for processing. Initially this is likely to be a small server application at St Cross Business Park in Newport, but as the need for larger-scale data processing emerges, there are plans to establish a larger, ‘green’ data centre. The proximity of the processing systems to the generation and demand-side assets is critical, as this reduces latency and ensures maximum responsiveness and security of the system. The wireless mesh platform has one of the most sophisticated authentication and encryption systems available. The control systems need to monitor the performance and outputs of the generation assets, and provide real-time assessments of the demand side of the market, with links to the houses and SMEs and the loads being managed by the utility SSE, as the Distribution Network Operator. The systems also need to provide a level of forecasting for assets, and reflect an accurate profile of the energy market by assimilating the patterns of the trades that are undertaken. Finally, they need to provide a control mechanism for curtailment events, and a feedback loop to the plant and machinery across the Island. As a by-product of this, the systems provide very accurate output information and alarms. The data will be accessible via central control screens in the main trading centre, but there will also be the option of displaying summary data in a real-time dashboard format on public display. One of the hidden benefits of this system will be to provide SSE with a fully integrated load management system, that can interface with its existing system to help balance the load and provide frequency response for the mix of generation assets. Solar and wind are intermittent resources, with a lot of energy when the sun is shining or the wind is blowing, and little or nothing when they are not. Total oversight of this generation capacity will provide a mechanism for balancing the loads using storage and demand-side management, thus reducing the need for ‘spinning reserve’ and avoiding costly re-enforcement issues. The active management of loads and generators connected to the grid can also help alleviate issues such as voltage, frequency, and reactive power control during faults. 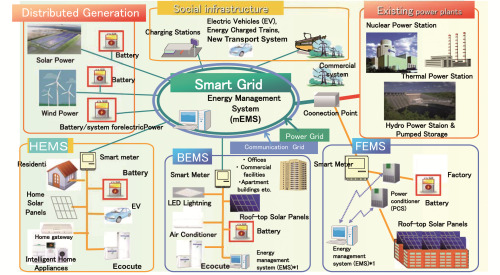 The net result of all the smart grid technology will mean a more stable and balanced grid network, with less of the generated capacity needing to be constrained by the network operator, and thereby maximising the value of generation from assets and producing a higher output per MW installed. In addition, it should help migrate home and SME demands away from peak times which, following the introduction of time-sensitive tariffs, will result in reduced energy bills. With the Isle of Wight’s EcoIsland project now under way, the idea is being pushed out to other communities around the world that also want to be self-sufficient in renewable energy and achieve sustainability in their land space. This is open to regions and cities as well as islands, since the emphasis is on community ownership. To this end, the first EcoIslands Global Summit took place in Cowes, Isle of Wight in mid-October, with speakers and participants from numerous other island and regional communities around the world. As well as workshops for discussion of the many aspects of the EcoIsland concept, the summit included a number of presentations on the various technologies in hand or under consideration. The keynote speech was given by the UK’s energy minister, John Hayes, in a clear signal that the national government sees this initiative as a significant step towards communities taking responsibility for their own energy needs and local environmental sustainability. Another key element of the summit was discussions and negotiations to encourage signatories to the EcoIslands Accord. This aims to unite island and regional communities around the world in a public commitment to the ambitious targets of becoming renewable energy self-sufficient by 2020, and sustainable by 2030. The latter is taken as the community’s ‘ecological footprint’ – a broader measure of sustainability than the widely discussed carbon footprint – being no larger than the actual land area it occupies. By way of example, Oxford-based sustainability consultancy Best Foot Forward has calculated the IOW’s ecological footprint, which has been estimated as nearly three islands’ worth of land – which clearly is not sustainable. EcoIsland and other IOW initiatives are expected to be already making progress in bringing this down. The EcoIslands Accord signatories so far include the Danish island of Bornholm, Winchester Action on Climate Change (representing the Hampshire city/region), and proxy signatures by the Scottish Islands Federation (15 in total) as well as Eigg and Cumbrae, and the US state of Hawaii, with other communities needing more time and discussions back home before formally signing the Accord. The Summit closed with a live video link to the first EcoIslands Ambassador, reggae artist and sustainability advocate Derek Sandy on the Caribbean island of Tobago, who gave the first play of his specially written reggae song as an anthem for the EcoIsland movement. The next Global Summit will take place next year on the Baltic island of Bornholm, with a further announcement once the initial arrangements have been made. In Part 2 we look at how the EcoIsland initiative will also use renewably produced hydrogen for transportation fuelling and as energy storage, in a project led by ITM Power with funding from the Technology Strategy Board. This article was originally published in the October 2012 issue of the Fuel Cells Bulletin – check out the sample Digital Edition.